A friend of mine contacted me the other day with the following problem: Help, I can’t find the static page option in WordPress. 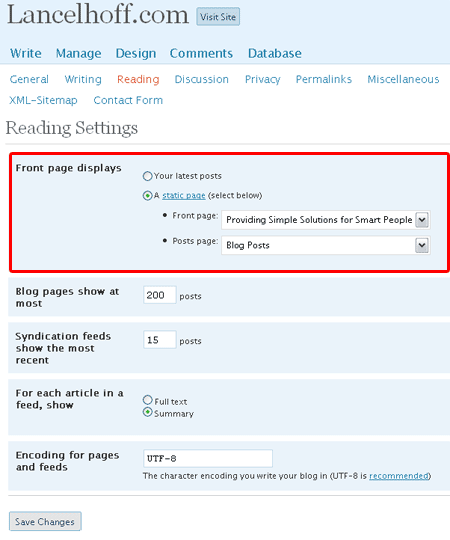 In the newer releases of WordPress, a blogger has the option to make their entry or home page appear as a chronological list of posts (posts page) or as an introductory static page. Using the WordPress static page feature will make your blog present much like a regular website. However, what many don’t know is that this option is not automatically available and does not appear by default. If the highlighted “front page displays” section does not appear, this simply means that you have not created a page on your blog yet. Once a page has been created, these static page options become available.